“NWC Series” Central Multi-circuit Chillers are designed for industrial and commercial applications from central process chilling to HVAC. The NWC series incorporates high efficiency Scroll compressors and stainless steel plate evaporators/condensers. Where redundancy, close temperature control and closed loop cooling water-cooled chillers are required on critical loads, the multi-circuit NWC system is your answer. 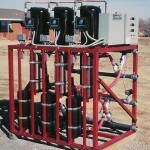 WPI offers complete water system design and manufacturing. ~ Water valves on each supply and return circuits. ~ Configurations designed to fit your physical space. Systems are easily serviced and accessible. Heat exchangers can be unbolted from the rear side and hose adapters make it very maintenance friendly. The systems can grow with your process and reduce your initial investment.